A model poses wearing Still The Right Stuff's replica Apollo flight jacket, which faithfully reproduces the iconic NASA coat. 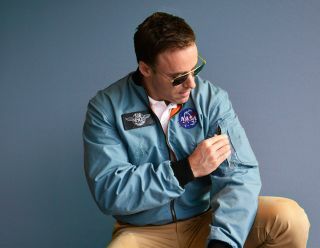 An Apollo astronaut, looking to keep the "right stuff" forefront in the public's eye, has recreated his iconic NASA-issued blue flight jacket down to the last button. Al Worden, who in 1971 flew to the moon as the pilot of the Apollo 15 command module Endeavour, wore out his original flight jacket years ago. But working with a space enthusiast out of London, Worden has now reproduced the distinctive NASA outerwear as a museum-quality replica, which is being offered for sale. "We discussed ways and methods of remembering the past greatness of the Apollo flights," Worden wrote in the letter that will accompany each of the jackets sold. "What could we do to keep the flame of exploration foremost in the minds of people who care?" "The answer," Al Worden explained, "was to offer authentic Apollo-era flight jackets to a small but dedicated group of space enthusiasts." But bringing the 40-year-old Apollo flight jacket back into production proved more difficult than creating your run-of-the-mill coat. Apollo 15 astronaut Al Worden seen wearing his original NASA-issued blue flight jacket. "These jackets were only issued to the elite, 'The Right Stuff,' and as such are surely one of the rarest and most desirable U.S. flight jackets ever produced," Worden and Pidcock describe in the release announcing Still The Right Stuff's inaugural offering. Like his fellow Apollo astronauts, Worden wore his jacket whenever he flew in NASA's T-38 supersonic jets to go where he and his crewmates were training for spaceflight and the geology they would likely encounter once on the moon. Although plentiful in photos taken of the astronauts in the mid-1960s and early 1970s, physical examples of the coat are few and far between today. With the help of some friends, Worden was able to source two of the original jackets for examination and patterning, including Apollo 7 astronaut Wally Schirra's jacket, which is displayed at the U.S. Astronaut Hall of Fame in Florida. Getting hold of a real jacket however, turned out to be the least of the challenges to producing a faithful replica. "It soon became apparent that the material of the correct weave and quality was not available 'off the shelf,' so the Right Stuff team set about to solve that problem," Worden and Pidcock wrote. As vintage fabric for the jackets was no longer available, Worden and Pidcock had to have new material woven. The jacket's outer shell was fabricated from cotton thread, which Still The Right Stuff had dyed to the correct shade of blue and then sewn on correct-for-the-period machines using the same weave pattern as the vintage coats. They did the same for the jacket's lining, having the iconic flame-orange Rayon material recreated from scratch. "We couldn't find the original cloth material so we, at great expense, contracted a company to reproduce exactly the material in the jackets we wore," Worden said. The jacket soft-goods sourced, the astronaut and attorney turned attention to the hardware. Fortunately, the zippers, studs and snaps were still available from the government contractor that produced the pieces for NASA. "[This flight jacket] is a truly authentic copy of the clothing we wore during the Apollo days," Worden wrote. Orders for the replica Apollo flight jacket have just begun through Alexander Leather Jackets in Scotland. The blue jacket is £450 (pound sterling), which at current exchange rates is about $740 (US). Still The Right Stuff plans additional offerings, including a limited edition "Signature" version of the flight jacket with its orange lining substituted by white silk and autographed by Worden. "All the variations of this jacket will be produced if there is demand, including the later gold-colored variant," Pidcock and Worden wrote. "Please enjoy this reminder of our greatest days in space and remember we can do the impossible again," Worden said, "if we keep the space exploration flame alive." A website for Still The Right Stuff will be online soon. For more information or to order an Apollo Flight Jacket in the interim, email Alexander Leathers at: info@alexanderleathers.com. Click through to collectSPACE.com for more photographs of Still The Right Stuff’s replica Apollo flight jacket.